Ever since I announced that I was going to be teaching a lighting workshop at the Santa Fe Photographic Workshops, I have had requests to teach a similar workshop on a regular basis. 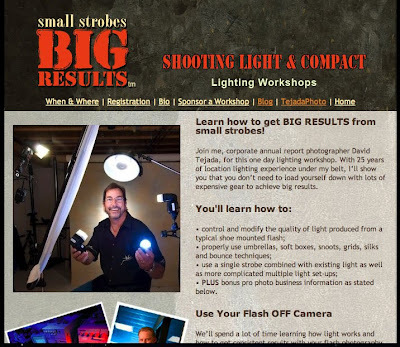 I am happy to announce that I have officially lunched my lighting workshops "Small Strobes, Big Results". I'll be holding my first 2 workshops in Denver, August 2 and 23rd 2008. Like a lot of workshops, I would love to take this workshop on the road. If you would like to sponsor a workshop in your area, please let me know. I'm very excited about the workshops and hope that you'll think about attending.